In February 1978, I emigrated from Boston, where I grew up, to California. This was the oft repeated, quintessential American journey of going west to find a new and better life. It was a major moment in my life. We traveled mostly on the interstate highway system which was largely complete at that time. From Oklahoma City, we followed Interstate-40 through the Southwest to Barstow, California, and then Interstate-15 into the Los Angeles area. This route closely parallels Historic Route 66, and this is when we had our first experiences on the now historic route. Numerous towns along the way were accessed by “I-40 Business Routes.” These routes were generally segments of Route 66 by which you entered one end of the town, drove through the downtown area, and then returned to the interstate on the other side of town. That was your route if looking for a place to stay or eat. Today, nearly every major highway interchange in America has a selection of motels, restaurants, mini-marts, and other travel services close and convenient to the exit. This was far less so in 1978. However in 1978 Route 66 was not really viewed as historic or nostalgic. Interstate-40 had largely opened and bypassed the route through the Southwest in the early 1970s. It simply wasn’t gone that long. There was no plethora of museums and visitor centers along the old route, as there is today, none of those brown signs along the interstate indicating an exit with Historic Route 66 access, no abundance of literature, no Internet with an endless number of websites about the subject. So driving across the country in the middle of winter, we were not looking for “kicks on Route 66.” The experiences we had were incidental to the trip. On a more recent trip (2010) I met an elderly gentleman from Georgia at the beautifully reconstructed Cool Springs Station, on Route 66 west of Kingman, Arizona. He and his wife were taking a commemorative trip along Route 66, marking his original trip out west by the same route in 1954. A sign on the side of his pickup proudly described his story. I asked the man how today’s Historic Route 66 compared to the route back then. He replied that he had little recollection of what it was like in 1954. Of course, that’s because he was then living what is today’s history. Traveling across country town to town on two-lane roads was the way of life back then. Quaint motor courts, mom-and-pop stores and businesses, oddball attractions were the norm. So nothing made a particular impression on him. He was just heading west, and I understood that completely. On the other hand, when one takes a nostalgic trip on a historic route, or if you are taking a life-changing trip, then everything makes an impression. I do in fact remember everything about my cross-country trip in 1978. It was a major moment in my life and one of my best adventures, something you can only do when you’re young. We simply closed out our affairs in Boston and left. There were no jobs waiting in California, no place to live. There wasn’t even a specific destination or a specific timetable to get there. We were living out on the road, driving a beat up old car, and the only constraint was having very little money. Below are my 1978 Route 66 remembrances (listed in order, east to west) with some notes as to the present-day conditions. Clinton, Oklahoma: A night in a motel in a nondescript town. I was fascinated that the motel had cable TV which was then in its infancy. I recollect watching then WTBS, channel 17 out of Atlanta. They were showing pro wrestling. Today: The Oklahoma Route 66 Museum is located in Clinton. Amarillo, Texas: This was our gaudiest Route 66 experience, a stop for lunch at the iconic Big Texas Steak Ranch. This rowdy, ultra cowboy-style restaurant is famous for its 72-ounce steak dinner. If you can eat the steak and all that comes with it in an hour, then it’s free! We settled for the 16-ounce steak dinners which were excellent and less than $10 each. Today: The Big Texas is going stronger than ever and now also features a human motel and a “horse motel” (stables). Tucumcari, New Mexico: We pulled into town on Route 66 after dark. The south side of the road was lit up in gaudy neon with numerous motels, restaurants, and businesses. The other side featured the railroad line and was completely dark. Today: The Blue Swallow Motel, opened for business in 1942, and in the National Register of Historic Places since 1993, is still open for business and going strong. Petrified Forest National Park, Arizona: The national park straddles I-40 and features the best views of the Painted Desert, spectacular fields of colorful petrified wood, Indian ruins, rock art, and dinosaur bones. Its Route 66 connection is that it also features the historic Painted Desert Inn (see photo at top). The inn is the only Route 66 historic site protected by a national park. Today: The National Park Service has in recent years refurbished the inn and restored it to its original condition during the glory days of Route 66. Holbrook, Arizona: We did not stop here but the town’s most iconic landmark had long been the Wigwam Motel. Each motel unit was a standalone cabin shaped like an Indian teepee. It closed in 1974, a few years after Route 66 had been bypassed. Today: The Wigwam was refurbished, and reopened in 1989, and is once again a highly popular Route 66 attraction (and place to spend a night). Winslow, Arizona: We did not stop here, but Route 66 in Winslow was home to the La Posada Hotel, the last of the great western “railroad hotels”, and considered by some to be the most magnificent of its breed. It opened in 1929 and closed in 1957 after railroad travel had become unfashionable. Today: The Santa Fe Railway took over the property, dispersing the beautiful furnishings, and brutally gutting and remodeling its interior into an office complex. The building was threatened with demolition when the railroad was done with it. Through the efforts of many, the building was saved and sold to a private party in 1997. Since then, the hotel, its gardens, and furnishings have been restored to pristine condition. It is now one of Arizona’s – and America’s – most outstanding National Historic Landmarks. Flagstaff, Arizona: We spent a night in the Pony Soldier Hotel on Route 66. The snow was lightly and gently falling in an almost Christmas-like scene. It was a somewhat melancholy evening, nearing the end of a long and difficult trip, and the only time I ever felt homesick. The town was rather small then with a limited number of hotels and services. The main drag, Santa Fe Avenue (Route 66), consisted of blocks of old commercial buildings on the north side of the road and the railroad and depot on the south side. The center of town, San Francisco Street, featured the old Monte Vista Hotel, one block north of Route 66. Today: Flagstaff is a city with many motels, restaurants, malls, and other businesses; tract housing, a major university, and daily traffic jams. The old downtown district was listed in the National Register of Historic Places in 1983. The city started revitalizing the downtown district around San Francisco Street in 1987 and now offers comfortable dining, shopping, sightseeing, etc. to tourists, students, and other visitors. The Monte Vista Hotel is still open and reputed to be haunted. Williams, Arizona: The only remaining town adjacent to I-40 which had yet to be bypassed. The interstate ended, and you had to drive through the town on Route 66 to reach the continuation of I-40 on the other side. Today: The town resisted the completion of I-40 for years (until 1984), fearing it would mean economic ruin. Now the Grand Canyon Railway is back in business as a major tourist attraction, with its depot in Williams. The town is also now a hotbed for Route 66 tourism. And it remains the gateway to the South Rim of the Grand Canyon. So it is doing just fine. Route 66 Segment, Seligman to Kingman, Arizona: This 80-mile segment went pretty fast and was rather nondescript to me. Keep in mind there was little Route 66 nostalgia in 1978. Also, we were nearing the end of a long, very cold road trip (that included a terrifying blizzard in the Midwest) and were looking forward to reaching the desert and warm weather at Needles, California, just a few hours ahead. Seligman was aged and ordinary. Peach Springs, headquarters of the Hualapai Nation, was quite run down. 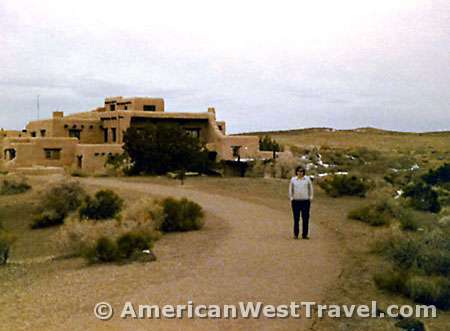 The modern Hualapai Lodge and visitor center was many years from being built. Kingman, located at the US-93 turnoff to Las Vegas, remained a busy town, with its gaudy, Route 66 downtown strip, with hotels, restaurants, and plenty of neon. Today: The Historic Route 66 Association of Arizona was founded in 1987 and has been wildly successful in creating interest in the route and its historic sites. Downtown Seligman was listed in the National Register of Historic Places in 2005. Its sites have been largely refurbished for tourism (see accompanying article), and in fact busloads of tourists show up to check it out. Grand Canyon Caverns has built a single, exotic motel room deep in the bottom of the caverns which anyone can rent for $700 per night. (There is more modest conventional lodging on the surface.) Peach Springs is now centered around the modern Hualapai Lodge. The Hualapai nation has become a major player in tourism following the construction of their Grand Canyon Skywalk. The Hackberry General Store is something of a combination gift shop and museum with lots of great memorabilia on display. Kingman is probably the heart of all Historic Route 66. It features the downtown strip of hotels and restaurants on Andy Devine Avenue. (The Quality Inn is a virtual Route 66 shrine.) It also features a commercial historic district (National Register of Historic Places in 1986), the Power House (1907) Visitor Center and Route 66 Museum, and headquarters of the Historic Route 66 Association. Needles, California: The warm desert temperatures were there as expected, and we gladly shed and stowed all the winter gear for good. We stopped for lunch at a taco stand on Route 66 in town where you got free food if you could correctly identify various quotations from the Bible. Not surprisingly, I paid for all of my food. Today: The Route 66 strip through Needles has not changed much over the years. There are some newer motels and restaurants but many older businesses, too, with an attractive amount of decrepitness.The historic El Garces Hotel (dating from 1907) is now being managed by the owners of Winslow’s La Posada, and they are in the process of rehabilitating this historic site into a working hotel. Today the Route 66 Experience is both nostalgic and historic, especially in the Southwest. There are good reasons for this. Wherever you go in America today, you will encounter the same motels, the same restaurants, the same gas stations, the same mini-marts, the same supermarkets and department stores, the same cable TV stations, the same Internet. Corporate America has largely put mom-and-pop out of business. Now that everything is largely the same, we miss the individuality that has been lost. We all yearn to see the quaint motor courts, the mom-and-pop stores and businesses, those oddball roadside attractions, and remember what was once upon a time. Everyone dreams of finding the wide-open spaces of the American West, and enjoying the freedom of the open road. It was still fairly easy to find wide-open spaces and open road in 1978. But things have changed since then. The American West, especially the Southwest, has undergone excruciatingly intensive development. Its population has doubled. Highways teem year-round with tourists and travelers from all over the world, not to mention the endless parade of nerve-wracking semis. It’s not an easy environment in which to kick back, relax, and enjoy the open road – you’ve got to find the right places to do it! Americans cherish freedom and individuality above all else. Perhaps those are the kicks we want from Route 66.